Stavāmṛta Kaṇā Vyākhyā by Radha Kund Mahant, Pandit Ananta Das Babaji Maharaj: Shrila Das Goswami is the embodiment of Shri Radha Kund’s mercy and therefore he is always aware of the kuṇḍa’s glories. For the sake of all the devotees who take shelter of Radharani’s lotus feet he reveals all the confidential truths about Radha Kund in this Radhakuṇḍāṣṭakam. In the previous verse it was explained that the wish yielding tree of mañjarī-bhāva sprouts in the hearts of those who simply bathe in Radha Kund. In this verse it is shown that not only the neophyte-devotees but even Vrajendra-nandana, the original Personality of Godhead, has his greatest desires fulfilled here by Shri Radha’s grace. This verse describes the sweet memory of a vision attained one day. Once Shripada Raghunath falls on the bank of Radha Kund, weeping out of separation from Shri Radharani. his life-airs reach up to his throat due to his strong feelings of love-in-separation. Suddenly he sees a sweet pastime before him. Absorbed in his mañjarī-svarūpa he sees the sweet meeting of Shri Shri Radha Madhava on the bank of the kuṇḍa. The Shri Yugala sits down in a beautiful kuñja on a jeweled throne faced by their girlfriends like Lalita and Vishakha, illuminating the bower house with their blue and golden auras. Many wave-like jokes well up in the ocean of their conversation and maidservants are around everywhere, absorbed in their service. Shri Raghunath Das, in his transcendental identity as Tulasi Manjari, serves the Divine Couple by fanning them. Everyone is immersed in boundless bliss. Then one very amazing wave wells up in this ocean of divine ecstasy: Shrimati sees her own golden luster reflected in Shyam’s shining emerald-colored bluish chest and she becomes angry with him, taking this luster to be that of one of her rival gopis. 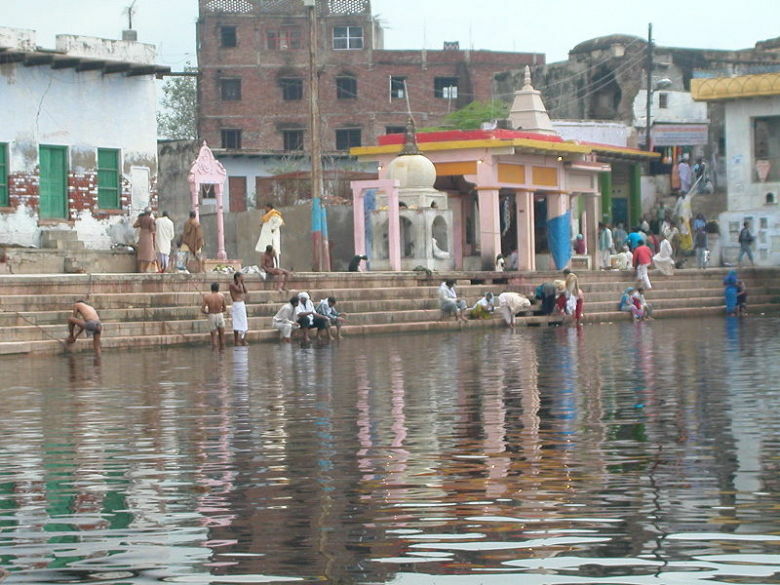 Before coming to Radha Kund, Radha had heard that Chandravali’s girlfriend Shyamala had met Shyamasundar on the bank of Kusuma Sarovar (close to Radha Kund) and had told him where he could meet Chandravali, and now, seeing her own reflection in his body, Radhika anxiously presumed that Krishna had actually met her. “Oh! Shyam is playing with Chandravali on his lap right before me! Who can tolerate that?” She went to another cottage near Radha Kund, covered her head with her veil and proudly turned her back on Krishna! Her girlfriends tried to convince her of Krishna’s innocence, but in vain! hari puna tāhe nā lāgi. But Shrimati’s māna did not subside because of the sakhis’ canvassing words. When she heard their words she thought that they were all engaged by Krishna in pacifying her with false and crooked words. As a princess, she gave up her honor, her family reputation and her shame and she went through different kinds of bodily suffering to come out of her house to see this boy, and now he enjoys with one of her rivals on his lap right before her? This agony is intolerable! mana māhā bhelo bahu bhīte. sundari! michāi koroho mujhe māna. nirahetu hetu, jāni tuhu rokhali. nā kohiye āna saṅe bāta. “My eyes don’t see anyone else but you. I don’t speak with anyone else. I don’t inquire from anyone else but from your girlfriends or maidservants and I don’t sit with anyone else either! Despite Nāgara’s endeavours Shrimati’s māna was not broken. She just stubbornly sat there, covering her head with her veil. One sakhī who witnessed Nāgara’s activities ran to Shrimati’s kuñja and told Kuṇḍeśvarī of Krishna’s devotional service to her kuṇḍa, making tears of compassion trickle from her lotus like eyes. The sakhis understood that Shrimati was pleased with Krishna again, so they quickly brought him to her.